Manufacturers. Surplus Petro Chemical, Laboratory & Industrial from Bamko Surplus in Texas City, Texas. Texas Ave, Texas City, TX. 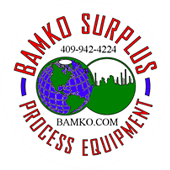 Copyright © 2019 BAMKO SURPLUS PROCESS EQUIPMENT. All rights reserved.